Cynthia Drake's home was filled with 3 inches of mud after heavy rains caused flash flooding near her home. That kind of rainfall only had a one in 1,000 chance of happening in any given year. But scientists say climate change could make these events more likely. Cynthia Drake’s home was almost destroyed by the floodwaters. She lives in the tiny town of Ripley, just east of Houghton. Her home is next to Ripley Creek -- and on June 17, the creek broke its banks. At 3 o'clock in the morning, she got the shock of her life. The flood waters piled up boulders around her house and sloshed three inches of mud inside it. Part of her foundation washed away. She says she had had some moderate worries about erosion from the local ski hill, and about the integrity of the old culvert-like structure (called a mine launder) next to her house that the creek passes through. But, she never could have imagined the torrential rain that would nearly cost her her home. “I didn't ever think anything like this would happen, so this caught me completely off guard," she said. Drake doesn’t have flood insurance. She’s not alone in her shock. Most people wouldn't have imagined such a thing. The rain that caused this flooding is the heaviest ever recorded in the area.The odds of rain like this were unbelievably small. A nearby rain gauge (at the Houghton County airport) recorded 5.55 inches of rain in just six hours. That rainfall was a 1,000-year event. That means rainfall that intense only has a one in 1,000 chance of occurring in a given year. Those odds are calculated using data from the rain gauge going back to 1887. 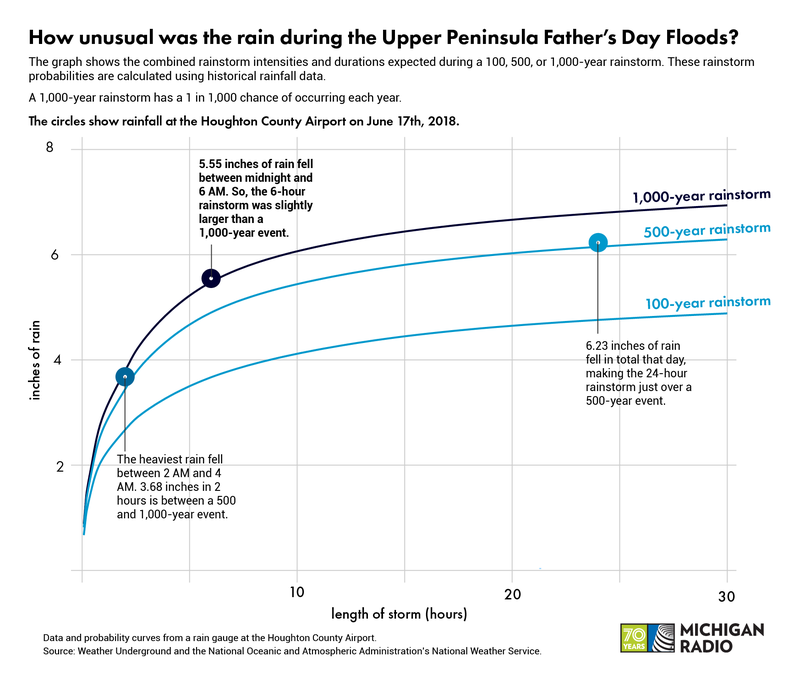 The rainfall between midnight and 6 AM at the Houghton County Airport on June 17th, 2018, was so heavy that it only had a 1 in 1,000 chance of occurring. So, what caused this extraordinary rain? Keith White is a meteorologist with the National Weather Service in Marquette. He says warm temperatures in the region essentially packed the atmosphere with water. “The warmer the atmosphere is, the more moisture it can hold, in layman's terms," said White. “There was a lot of sort of re-invigoration and redevelopment over the same spot during that very short time frame that really allowed those rainfall totals to increase." Climate scientists say storms like the one in Houghton County are becoming more common. Kenneth Kunkel is a scientist at the Cooperative Institute for Climate and Satellites at the National Oceanic and Atmospheric Administration. He’s been studying extreme rainfall for at least 25 years. Kunkel says these increases are consistent with warming from human-caused climate change, because warmer air holds more water. He says he expects extreme rain events to keep increasing. “When you have a situation that can create heavy rainfall, much like what happened in the Upper Peninsula with this event, the amount of water vapor will be greater and that will simply lead to more intense rainfall," he said. Cynthia Drake wants the community to plan ahead to prevent disaster if there’s another big rain. Right now, she's focused on saving her home. Residents are beginning the process of recovery after flash flooding rocked the western Upper Peninsula Sunday morning, leaving dozens of sinkholes, impassable roads, and reports of damage to hundreds of homes in Houghton County.